Genius is relative in The Big Bang Theory Party Game, an addictive new game that allows you and your friends to revisit unforgettable moments from the smash hit TV series. Whether you’ve earned a Ph.D. in the science of “The Big Bang Theory” or are discovering the world of Leonard, Sheldon, Howard, Raj, and their neighbor Penny for the first time, you’re guaranteed to be laughing and having fun. Just deal out the cards and you’re ready to play! In each round, one player will serve as Referee, and the other players will each submit one or two cards that they feel best describes the category or description on the Referee’s card. The Referee awards discretionary points to each player, and then it’s on to the next round with new cards and a new category. But watch out — there are several cards in the deck that might change the category at random! With nearly 300 cards ranging from Space Poop to Super Powers and Goth Chicks to Horny Engineer, The Big Bang Theory Party Game has everything you love about the show — right at your fingertips. I bought this for a friend of mine, who is a big fan of the show. It was quite fun in the beginning, but after a while we just sort of got bored. The replay value isn’t that great. I would have preferred a little more thought in to the game. We played it a couple of times and my friend really loved it as a gift. You really have to be a fan of the show to really get something out of it or else it will feel like a never-ending, ever-repeating sample of already know jokes and puns. In theory it would have been a fun game, in reality it just didn’t do it for us. It was a definite disappointment. 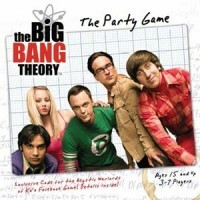 Add a Review for "The Big Bang Theory Party Game"